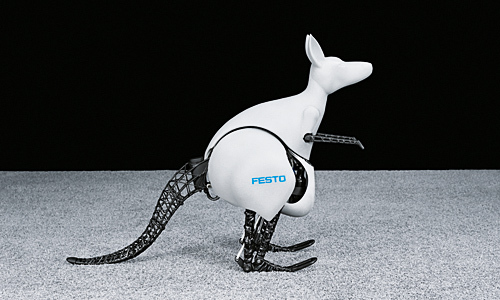 Festo, a leading German supplier of automation technology, has managed to develop a gesture controlled kangaroo robot capable of replicating the real kangaroo’s graceful and energy efficient movements, to explore the idea of recovering energy in industrial automation. According to the blog post by PTC, Festo scientists from its Bionic Learning Network have designed and developed the Bionic Kangaroo, capable of reproducing the animal’s capacity and capability to move quickly for incredible lengths of time without using large amounts of energy. Each time its feet hit the ground, the Achilles tendon in its hind legs stretches to store energy, which is subsequently used for the next jump. The robot uses a combination of pneumatic and electric drive technology to emulate these movements and recover, store and retrieve energy to use on its next bounce, just like a real kangaroo does. Standing at just over three feet and weighing15 pounds, the Bionic Kangaroo can hop a distance of about two and a half feet and can jump over a foot high by using an elastic band made of rubber, which is fastened to the back of the robot’s foot, parallel to a pneumatic cylinder on the knee joint. This bands acts as an Achilles tendon in a real kangaroo, cushioning the hop while simultaneously absorbing kinetic energy and releasing it for the next jump. Driven by pressurised gas, the elastic tendon tenses up and activates the motors near the hip of the kangaroo, making it to lean forward. When the robot reaches certain angle, the energy is released and allows the robot to hop. To insure stability while jumping and landing, the team of developers used integrated controls, condition monitoring and real-time diagnostics, which allow the robot to use a set of algorithms to correct its movement and make sure it does not crash. The Bionic Kangaroo relies on two power sources: one is a small compressor that provides high pressure air for the pneumatic muscles that power the jumping and the other is a set of lightweight batteries that power the entire robot. However, the company won’t be selling its creation to individuals and opted to go with a more focused approach, using the robot as a tool to show the power of biomimetics, which is a field of science that uses natural-world designs to create things to benefit people.